This could hardly be called our neighborhood park as it was a half hour walk from my neighborhood, about half that time for those went by bike. 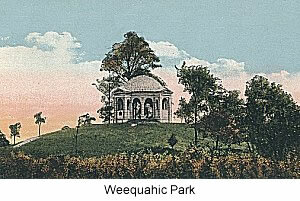 Weequahic was truly a park for all seasons. In the winter the large lake froze and accommodated ice skaters. There was no charge unless you wanted to rent a locker to put your street shoes in. None of the crowd I was a part of ever rented a locker, we simply put our shoes under a tree, made a mental note where the tree was and took-off. No shoes were ever stolen although sometimes a search went on and on looking for the right tree. The building that was a boathouse in the summer became a place to buy snacks. The big seller was watery hot chocolate. It was a big disappointment to walk to the park on a cold winter night and find that the "red ball" was not up. The "red ball" was a white flag with a red ball on it. If it was not flying it meant the ice was too thin to allow skating. In the summer the big draw was row boating. There was an hourly charge for the boats. Fishing was permitted from the boats. Along the edges of the lake polywogs could usually be found. The ones that we caught were always given to one of the school teachers. What they did with them I have no idea. There were tennis courts and at one time a small golf course. These were activities for which there was a charge. None of my friends or I ever participated in these activities. A grandstand ran half way around an area in which various school athletic events took place. At another time horse and sulky races took place. There was no authorized betting and no betting of any kind allowed, though frequently after a race money could be seen changing hands. Not enough you say, well there was also the gazebo or what we called at that time "The Monument" This was the place that romantic couples went to after dark. The park police were also aware of the gazebo and for what purpose it was being used. It was on their schedule of periodic stops. I was too young to have any first hand knowledge of what went on in the gazebo after dark. When I was old enough to think I might have some need of it, the park was no longer a safe place to be after dark. Someone, or two was elected to to go to the counter to pick-up the goodies and the rest went to find a place to sit at the wooden tables. There were vendors in the park on on the adjacent streets selling all sorts of things to eat and novelty items such as balloons and pin wheels. A trip to the park on a Sunday was something to look forward to. You usually met friends at the park and sometimes made new ones.